Finian's Oscar defied an eight-pound penalty to record a battling two and a quarter length success over two and a half miles. The 10/11 favourite looked beaten after eventual runner-up Movewiththetimes jumped to the front at the second last but the five-year-old didn't give up and battled back to hit the front on the run-in. It was a poignant victory as his owner, Alan Potts, died earlier this week aged 80 and Finian's Oscar's trainer, Colin Tizzard, was quick to pay tribute to both horse and owner. "He's showed it all there really," said Tizzard. "It was a slowly run two-and-a-half-mile race and, going to the last, we all thought he was beat. However, Bryan (Cooper - jockey) was very positive on him today and he found plenty on the run-in. "He's a class horse. To win this for Alan, who passed away on Sunday, was great. There's a fair bit of Alan in this horse to be fair as, when push comes to shove, he keeps finding more and never gives in. "This is as nice a horse as we've had for a while because he races behind the bridle. By that I mean that you need to ask for a bit but, when you ask, he finds. "You forget that he's only five-years-old and to give eight pounds to some decent horses, it's a good performance. It was only this time last year that he's won his point to point. "We also saw something today that we haven't seen before in that he could be a two miler. A strongly run two miles could be right up his street come March. We'll learn more as the season goes on but he's been very professional today." Paul Nicholls was pleased with the performance of Movewiththetimes who was a game second. Held up early on in the extended two and a half-mile contest under Barry Geraghty, the six-year-old son of Presenting took the lead approaching the final fence but was reeled in by Colin Tizzard's charge, who rallied gamely under Bryan Cooper. 12/1 chance Coo Star Sivola, trained by Nick Williams, was a further four lengths back in third. Ditcheat handler Nicholls said: "He did everything well today. He travelled well, jumped well and has just got beaten by the better horse on the day. "He has run a really good race and perhaps a more galloping track would suit him a bit better." 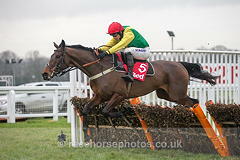 Jockey Barry Geraghty said: "He jumped better today and found a really nice rhythm. He is versatile enough with regards to the trip but the winner is the real deal." Nicky Henderson had news of William Henry, who was pulled up before the eighth fence when his saddle slipped. "He jumped badly right all the way but I saw Might Bite (also trained by Henderson and winner of last year's RSA Chase at The Festival) do exactly the same thing on his first start here so I'm living on those omens! "Davy Russell (jockey) did the right thing in pulling him up so we'll take him back and school him again next week. He does have a tendency to do that but he frightened himself at the first and that was that."